【SIZE & MATERIAL】-Our Statement Pendant Necklace's Chain length 30'' + 3'' Extender with a curbe chain and lobster clasp closure;pendant size: 2.8" ;weight:Approx 0.8 oz,Comfortable to Wear;Made of Alloy,100% Handmade,Lead Free,Nickel Free Eco-friend Alloy,It will never fade and is not allergy for your skin, suitable for sensitive skins,no harm to health. 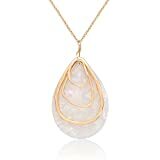 【GIFT FOR HER】-This Stylish teardrop circle Pendant necklace is a thoughtful present for mom, wife, girlfriend, best friend, girls, teen girls or yourself on Christmas, Birthday, Anniversary, Mother's Day, Valentines Day, or just send as a surprise gift for that special one in your life to remind her how much you care! 【MATCH TO MOST OCCASIONS】-The Drop circle teardrop Pendant Necklace set is suitable for you to attend special occasions such as, wedding, birthday party, prom or pageant. This type of three circle pendant necklace will enhance your look besides decorate your beautiful mood and attract great attentions. 【CUSTOMER SERVICE】-100% satisfaction and 30-day money-back guarantee for any reason; 12-month warranty for quality-related issues. If there are any problems with the purchase, please feel free to contact us.